Hello, this week supersonic steels, fast formula cars and upset Spanish scientists. But what are they arguing about? Here's Katherine Holt. What's in a name? How do we decide what to call an element anyway? Is the name of an element the same in all languages? Does it matter? And who decides? Well the answer to the last question is easy – the naming of elements is ultimately decided by IUPAC – the International Union for Pure and Applied Chemistry. The answer to the other questions is mainly 'it depends'! Take for example the case of element 74 – or as we call it in English – tungsten. Ever wonder why its symbol is W? Chemists in many European countries don't have to wonder why – because they call it Wolfram. The two-name confusion arises from early mineralogy. The name 'tungsten' is derived from the old Swedish name for 'heavy stone', a name given to a known tungsten-containing mineral. The name 'wolfram' comes from a different mineral, wolframite, which also has a high content of the element we call tungsten. Until recently both names (tungsten and wolfram) were included in 'Nomenclature of Inorganic Chemistry – IUPAC Recommendations' or the 'Red book' as it is known in IUPAC circles. 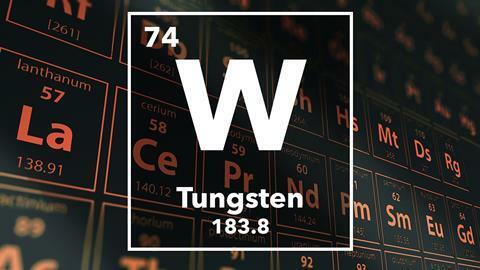 However in 2005 'wolfram' was dropped and tungsten became the sole official IUPAC name for this element. However, wolfram did not go down without a fight! In particular the Spanish chemists were unhappy to see the change – not least because their compatriots the Delhuyar brothers are credited with the discovery of the element and its isolation from the mineral wolframite. In their original paper, the Delhuyar brothers requested the name wolfram for the newly isolated element, saying 'We will call this new metal wolfram, taking its name from the matter of which it has been extracted.this name is more suitable than tungsten... because wolframite is a mineral which was known long before... at least among the mineralogists, and also because the name wolfram is accepted in almost all European languages..."
Although this may be a compelling case, IUPAC argues that is that its working language is English and so tungsten is the most appropriate name. They make the point that students will have to learn some history of chemistry to know why the element symbol is W. The same is true also for a number of other elements, such as potassium, mercury, and silver whose symbols bear no relation to their English name. However, it seems unlikely to me that such a colourful name as wolfram will be forgotten. In case you were wondering, it is believed to be derived from the German for 'wolf's foam'. Many centuries ago, mid-European tin smelters observed that when a certain mineral was present in the tin ore, their yield of tin was much reduced. They called this mineral 'wolfs foam' because, they said, it devoured the tin much like a wolf would devour a sheep! Thus over time the name 'wolframite' evolved for this tungsten containing ore. In contrast to its semi-mythical role in early metallurgy, these days the applications of tungsten are highly technological, making use of its hardness, stability and high melting point. Current uses are as electrodes, heating elements and field emitters, and as filaments in light bulbs and cathode ray tubes. Tungsten is commonly used in heavy metal alloys such as high speed steel, from which cutting tools are manufactured. It is also used in the so-called 'superalloys' to form wear-resistant coatings. Its density makes it useful as ballast in aircraft and in Formula 1 cars and more controversially as supersonic shrapnel and armour piercing ammunition in missiles. It seems to me that the name tungsten, or 'heavy stone', is justified by these applications, which exploit its strength and density. I'm glad, though, that the birth of chemistry in the activity of those ancient metallurgists and mineralogists is still celebrated by the use of the symbol W for element 74. This ensures that we never forget that there was a time, not so long ago, when many chemical processes could only be explained through metaphor. 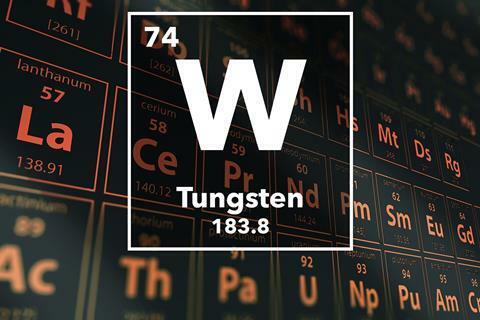 I always used to remember tungsten's letter W as standing for the wrong symbol, but can you think of the one letter of the alphabet that isn't used in the periodic table? Now there's something to ponder on. In the meantime, thank you very much to UCL's Katherine Holt. Next week we'll meet the element that was introduced to the world in, its fair to say, a pretty unusual way. The first hint the world had of the existence of americium was not in a paper for a distinguished journal but on a children's radio quiz in 1945. 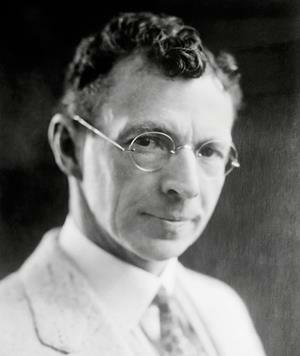 Seaborg appeared as a guest on MBC's Quiz Kids show where one of the participants asked him if they produced any other new elements as well as plutonium and neptunium. As Seaborg was due to formally announce the discovery of americium five days later he let slip its existance along with element 96. And Brian Clegg will be telling the story of the radio active element americium and how it keeps homes safe in next week's Chemistry in its element, I hope you can join us. I'm Chris Smith, thank you for listening and goodbye.